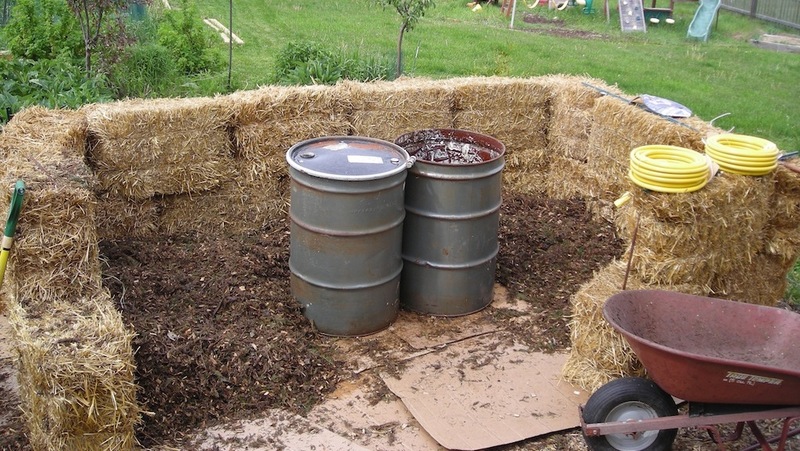 Jean Pain Compost Methods – It Begins. I’ve posted before about my infatuation with Jean Pain’s work and my desire to try to recreate his experiments here in Wisconsin. Actually, when you break it down its a no brainer – I love compost and coppicing, plus I get to use chain saws, massive chippers dump trucks, and skid steers. Given the chance, I would coppice and chop up trees and pile the chips on my days off for free, the fact that I get methane, hot water and tons of compost out of the deal is icing on the cake! Despite its awesomeness, this has been a “backburner” project for me. We did a test run a few weeks ago at the farm -coppicing 25 3″ trunk diameter box elders and running them through my Bio-80 chipper. 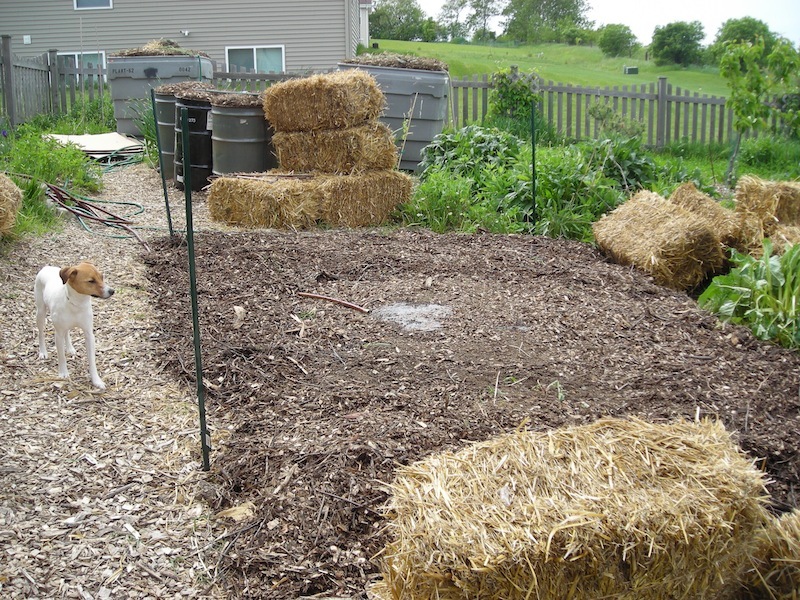 The goal was to make a yard or so of fresh chips for use as mushroom growing medium. 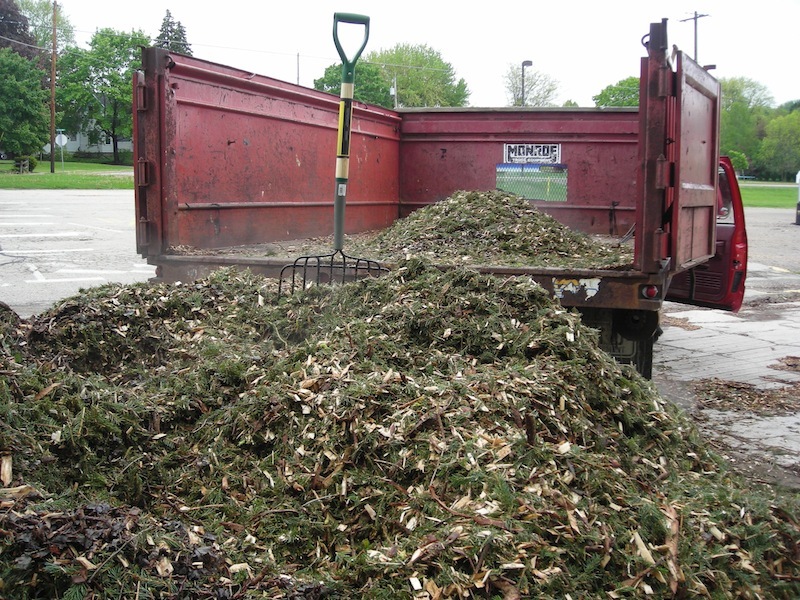 As the whole, green trees went through the chipper the end product was fantastic – finely diced/shredded with tons of green material from the sap and leaves. Unfotunately after about 2-3 hours of work, we had about 21 cu ft of chips (.6 cu yards). From 25 trees. Oi. Jean Pain’s piles were 50 ton, or about 100 cu yards. 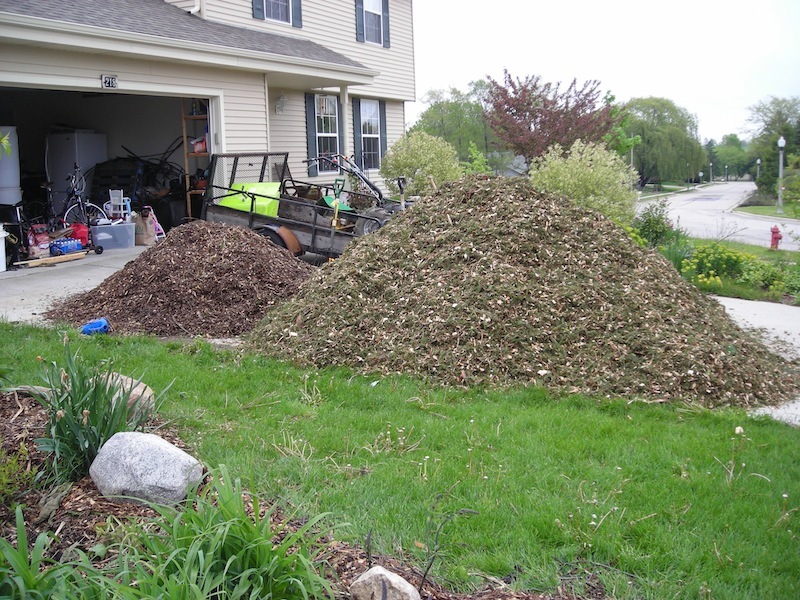 It would take a week to make a pile big enough –even if we could get the trees. Of course we could rent a bigger chipper, but with all the farming going on, the idea got shelved. Until today. The bed holds 10 cu yards - I took about 7-8. See that steam? And it had only been sitting for less than a day! 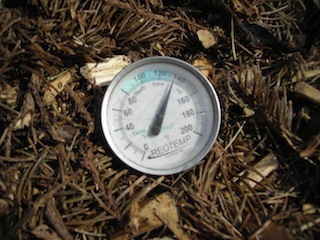 I check my village’s mulch pile with the same frequency most men check baseball stats – for 2 weeks now it has been completely out – but yesterday or this morning someone dropped off about 12 cu yards of fresh ground young pine tree. Just driving up I could see how many needles were left – the pile was virtually green. BINGO! While there was no way I had time to cut and grind up 500 box elders, I could spend an hour forking 7 yards into B.A.R.T. I *knew* there was a reason I skipped the gym today! 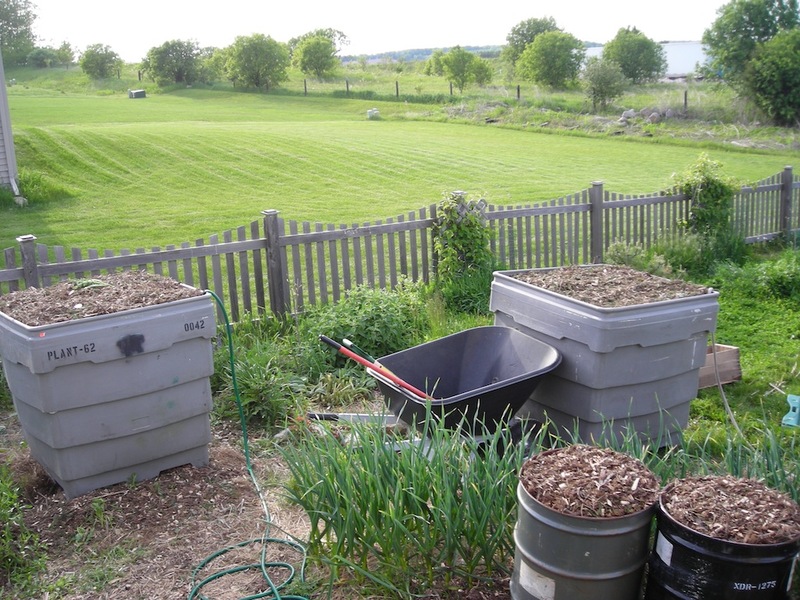 As we are looking to do a major expansion (+500%)of our home gardens this month, I will need a significant amount of compost this fall – so despite living in an HOA I trundled my load of green gold home and proceeded to make a massive pile on the driveway. Once finished cooking, this should be about 1500#’s of compost. The fact that I already had a 3 yard pile of mulch chips already on the driveway only adds to the head shaking by the neighbors. If they only knew what I had in store! What do I have in store? 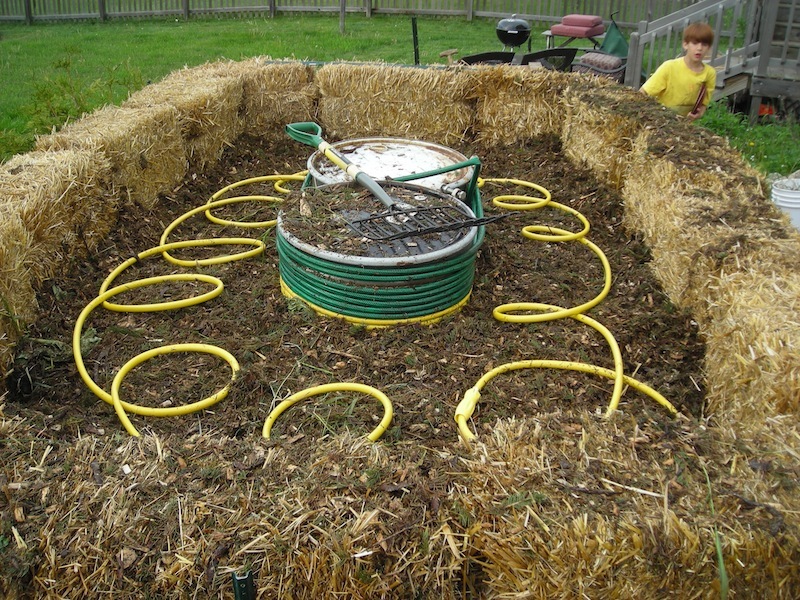 I want to build a Proof of Concept for a smaller scale Jean Pain compost system. I want to produce burnable methane, hot water, and humus from chipped green brush material. 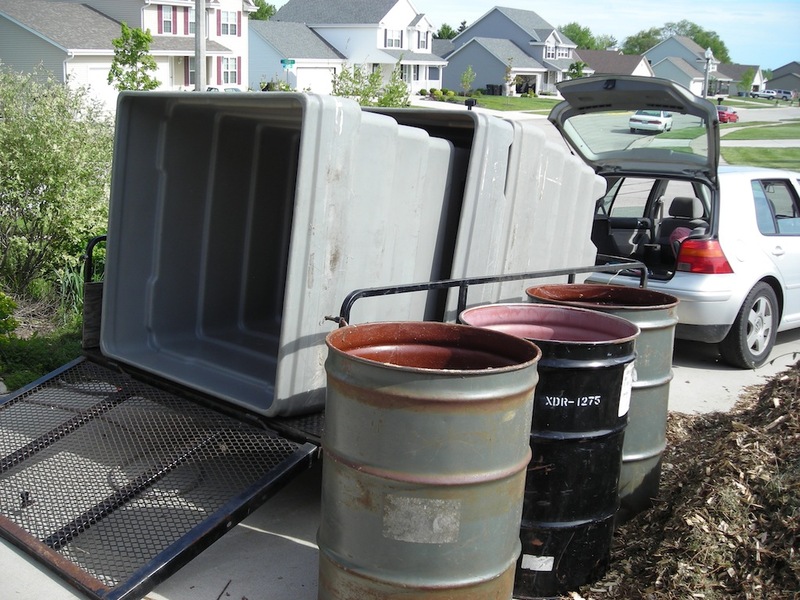 To do this I intend to get 4 55 gallon drums that I have at the farm. these drums have clamp on tops which will make filling them with a digestible slurry easy. I will place these in the center of a 10’x10′ area and fill them half or so full with the brush and the rest with water -need to read up on that more. Around the barrels I will wrap tubing, which I will then spiral through the brush material as I pile it up around the barrels about 3′ wide on all sides. This will allow the cold water to cool the barrels down as the pile will likely hit 140 degrees, but methane bacteria prefer 85-105 degrees. The area will likely be penned in with some garden or snow fencing. Onto the barrels I will plumb in some tubing bungs to allow the methane to vent off. I will then collect the methane in …. something. I will be scrounging U-Line and other sources for large plastic bags – enough to hold 2-3 cu meters or I will make my own out of plastic sheeting. I would LOVE to find a spark proof compressor to allow for storage in propane tanks, but if not I will likely just flare it off. The goal here is to prove that I can produce ignitable methane, not if I can store it or run engines on it. (that said, I have dreams of converting an old lawn tractor to run on methane and use a gas grill propane tank to power it). In the spirit of simplicity, for starters I will use city water to cool the drums and will take temp readings from the water on the end to track heating capacity. If things go well and I need alot of cooling (I do NOT want to keep a hose running all the time! ), I may plumb in a 300 gallon storage tank and convert an old truck radiator for a heat exchanger to create a closed loop space heating system. 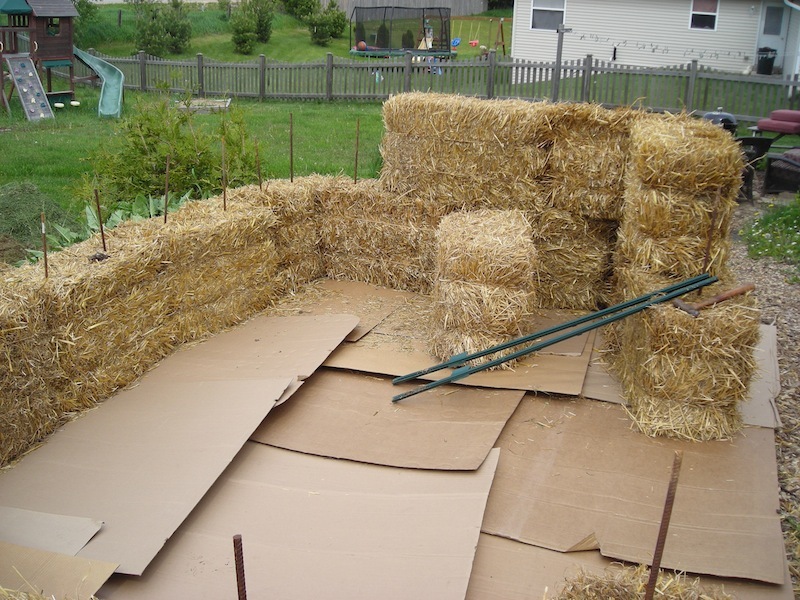 But I am getting ahead of myself… My goal is to produce burnable methane, in my backyard, with no fancy gizmos. 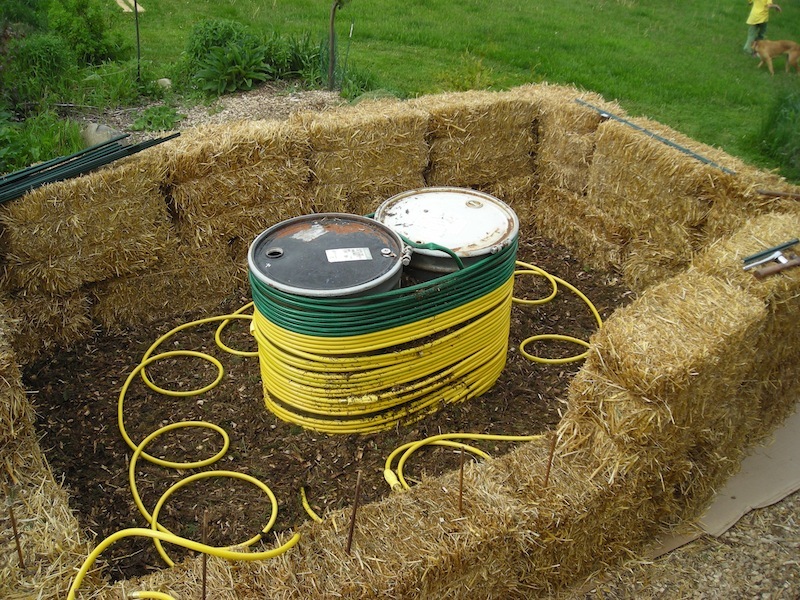 Growing Power built a methane digester and theirs cost $750,000. I am shooting for about $250 and that is only if I do my heat exchanger idea. Of course, my scale is wicked smaller. I have a uber steep learning curve on methane (Dammit Jim! I’m a potato farmer not a renewable energy technician!) so I am using a life line. See, one of my good friends just happens to run the village’s sewer plant and knows rather a bit about producing methane. Luckily I have the first round of spuds in the ground and have a few weeks of relative calm. Tomorrow and Friday I will be clearing the 10×10 area, bringing the drums down and soaking the chips.